with Google's logo looming over the skyline. Technocrats at Google have a scientific solution for every problem, including cities. The problem is that Google or any other Big Tech company has no experience in urban planning or designing cities, so the result is nothing more than their own private vision of Utopia. Even with a chilly mid-May breeze blowing off Lake Ontario, this city's western waterfront approaches idyllic. The lake laps up against the boardwalk, people sit in colorful Adirondack chairs and footfalls of pedestrians compete with the cry of gulls. But walk east, and the scene quickly changes. Cut off from gleaming downtown Toronto by the Gardiner Expressway, the city trails off into a dusty landscape of rock-strewn parking lots and heaps of construction materials. Toronto's eastern waterfront is bleak enough that Guillermo del Toro's gothic film The Shape of Water used it as a plausible stand-in for Baltimore circa 1962. "It's this weird industrial land that's just been sitting there - acres and acres of it. And no one's really known what to do with it." This past October, a coalition of the Toronto, Ontario and Canadian governments contracted with Sidewalk Labs, a sister company of Google, to come up with a $50 million design for a dozen acres on the waterfront's far eastern end. "the world's first neighborhood built from the internet up," as Sidewalk describes it. The neighborhood, called Quayside, would leapfrog the usual slow walk of gentrification to build an entire zone, all at once, as a "smart city," a sensor-enabled, highly wired metropolis that can run itself. 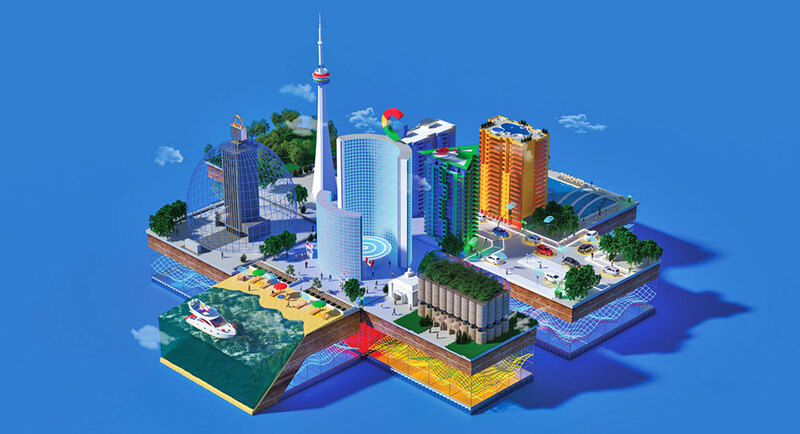 Toronto's choice of the Google-affiliated firm immediately captured the attention of urban planners and city officials all over the world; magazine stories trumpeted "Google's Guinea-Pig City" and "A Smarter Smart City." Still in its early days, the partnership has left people curious but wary. Google...? What does a tech company know about running a real live city? In one sense, what's perhaps surprising is that it has taken this long. Silicon Valley's innovators have long had side obsessions with making the world a better place, driven largely by the confidence that their own brainpower and a near-total disregard for tradition can break old logjams. PayPal co-founder Peter Thiel helped seed the "seasteading" movement to create offshore libertarian paradises; the tech incubator YCombinator is currently running a public-policy experiment in Oakland, California, giving residents a guaranteed monthly stipend to see how it might improve their quality of life. The notion of the feedback-rich "smart city" has circulated for years, and in practice has mostly taken the shape of centuries-old cities like New York or Boston adopting sensor-enabled stoplights or equipping their residents with an app for spotting potholes. But the real dream, a place whose constant data flow lets it optimize services constantly, requires something different, a ground-up project not only woven through with sensors and Wi-Fi, but shaped around waves of innovation still to come, like self-driving cars. Thanks to a host of technological advances, that's practical now in a way it never has been before. Mass-produced sensors now cost less than a dollar apiece, even for hobbyists; high-speed broadband and cheap cloud computing mean that a city can collect and analyze reams of data in real time. In Toronto, Sidewalk sketches out a picture of a neighborhood where intelligent "pay-as-you-throw" garbage chutes separate out recyclables and charge households by waste output; where hyperlocal weather sensors could detect a coming squall and heat up a snow-melting sidewalk. Apps would tell residents when the Adirondack chairs on the waterfront are open, and neighbors would crowdsource approvals for block-party permits, giving a thumbs-up or thumbs-down based on the noise the gathering was expected to produce. Traffic signals could auto-calibrate to ease pedestrian congestion during public events, or to ensure a smooth rush hour. The data from such systems would feed back into the city, which would constantly learn, optimizing its own operations from month to month, year to year. "the most measurable community in the world." "the world's first neighborhood built from the internet up." But with it comes a host of new questions, points out Vaughan, the Toronto MP. Day to day, a truly smart city runs on data and algorithms rather than civic decisions made by humans. 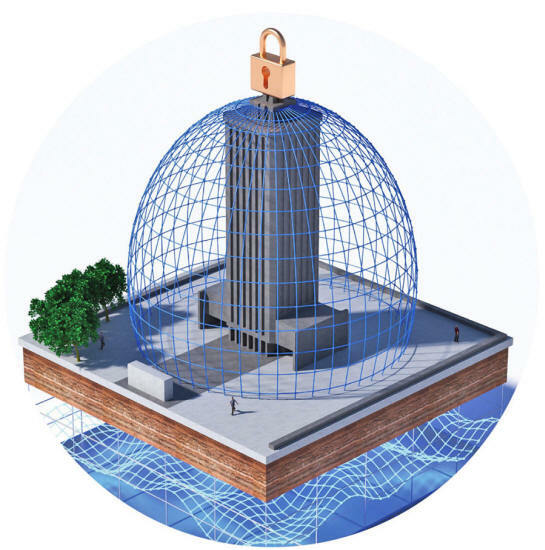 Who owns all the data produced by the city of the future? 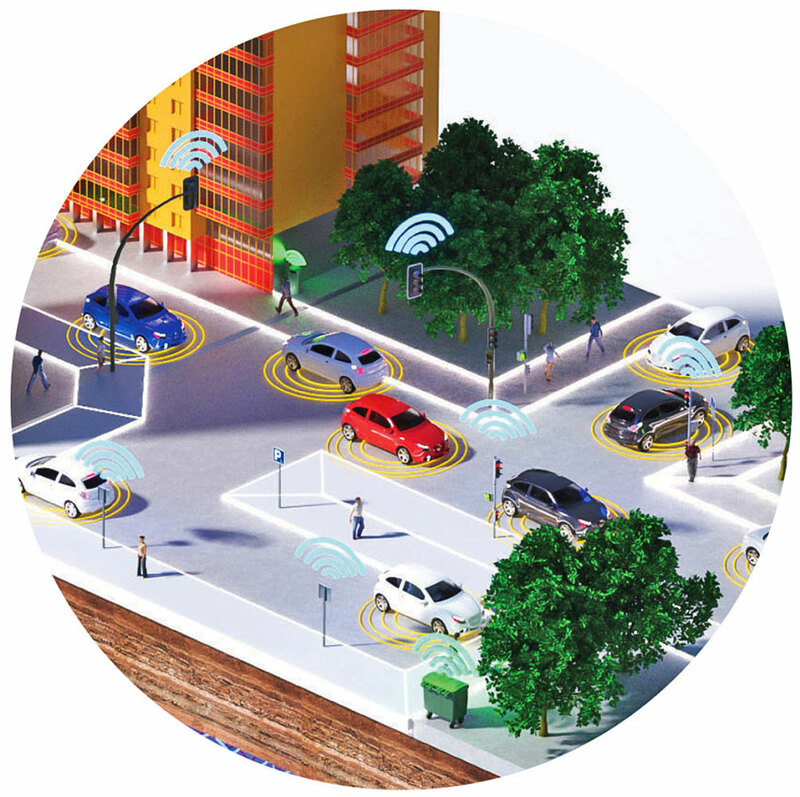 "Smart city" technology could be transformative, efficient and even eco-friendly - but it also raises thorny new issues for city leaders, from basic concerns about citizen privacy to big questions about balancing democracy with corporate control. Some of the worries are abstract and long-term, such as whether it's possible to have too much order, stripping cities of their energy and serendipity. In May, New York City named the nation's first civic algorithm task force to monitor how automated decision-making affects citizens. Here's a short series of primers on the questions raised by projects in Toronto and elsewhere. These have been mostly abstract questions for urban-studies seminars so far, as cities adopt relatively small-bore innovations, like a streetlight system in Chicago that self-reports malfunctions to keep the lights on in high-crime areas. But there are already hints of darker potential. The ruler of Dubai says his plan to collect data on citizens is intended to "make Dubai the happiest city on earth," but skeptics of the United Arab Emirates' human rights record aren't so sure what will happen when all its cellphone-obsessed residents are being tracked by an authoritarian state. "The reality is that conversation is coming to cities anyway," Vaughan says. "Let's have it now." Fans of what's become known as Sidewalk Toronto say there are few better places to have this conversation than Canada, a Western democracy that takes seriously debates over informational privacy and data ownership - and is known for managing to stay polite while discussing even hot-button civic issues. Hitching up with tech companies that are flush with both cash and grand visions might be cities' best chance to leap into the future, or at least to turbocharge their lagging districts. But some aren't so sure cities will get the better end of the deal. Google is already buying up chunks of the Bay Area and New York; its power and public appeal could easily overwhelm cash-strapped local governments even before it becomes the repository for all that citizen data. Some urbanists and good-government advocates fret that going down the aisle with big corporations might be a short-term salvation that, generations from now, will have set cities on the wrong path. Anthony Townsend, an urban planner and forecaster, has spent most of his career on the question of how the thoughtful application of technology can help cities solve their problems, including challenges of sustainability and inclusion. He is a champion of the idea that cities should engage in careful "digital master planning," thinking through for themselves the role of technology in urban life. ...but also warns that cities are in danger of blindly and haphazardly embracing innovations presented to them by industry. ▼ But to critics, nonstop data looks a lot like tracking and surveillance - opening big questions about privacy risks, plus how the data is used and who controls it. Rather than designing its own tech fantasy from scratch, Sidewalk started by asking Toronto for its own vision for its future, through a full year of public consultations, and it is using that to shape the company's plans. He wonders, though, whether Quayside is ambitious enough - whether its accumulation of existing technology really amounts to the kind of breakthrough cities need. Modern cities, with money and an educated population, should be the labs for big new ideas about living, and Sidewalk is their best shot right now. "I look at the bar that Google and [parent company] Alphabet have set for innovation, I look at what was proposed for Toronto, and I think, where are the moonshots?" he wonders. Other observers counter that Sidewalk is aiming high - that aggregating all that technology in one place could be its own kind of breakthrough. The Romans didn't invent the aqueduct, but their engineering skill meant that their capital had a totally unprecedented supply of clean water, allowing them to build a city like nothing else that had ever existed. Modern cities thrive on information, but none has built itself around data infrastructure in a similar way; connecting a bevy of smaller-scale innovations through a common networked digital platform could be a hugely powerful innovation in itself. Sidewalk's former chief operating officer, borrowing a term from the software world, calls it a chance to "re-imagine the full stack." "when you put it all together, you are talking about the future being fast forwarded." Google is not the first company to try reimagining a city. Epcot Center, the Florida theme park, has its roots as a real city-building idea. "take its cue from the new ideas and new technologies that are now emerging from the creative centers of American industry." "I don't believe there's a challenge anywhere in the world that's more important to people everywhere than finding solutions to the problems of our cities," Disney said in a 1966 promo film (below video) introducing what would become Disney World. No less than the New York "master builder" Robert Moses called Disney's vision for Epcot "overwhelming." But it wouldn't come to pass. Disney died of lung cancer shortly after shooting that film, and Disney, the company, balked at being in the city-building business. It ended up as a theme park. But a great deal has changed since Disney's time. Cities themselves have more money and energy than ever; rather than building from scratch, like Disney did, modern smart-city builders want to harness the energy and dynamism of existing cities. And today's "new technologies" are more seamlessly integrated into people's daily lives than even Disney might have imagined. The corporations behind the technologies, like Google, have the power and reach to envision changes on a scale far beyond a theme park. A truly smart city runs on data and algorithms rather than civic decisions made by humans. So, who owns all the data? Whose laws apply? Google had been interested in city-building for some time - former Google CEO Eric Schmidt has said that founders Larry Page and Sergey Brin began dreaming about reengineering cities "years ago" - but its venture into urbanism got more concrete in 2014, when Schmidt reached out to Dan Doctoroff, an investor and philanthropist who had been a deputy mayor of New York during Michael Bloomberg's administration and energetically drove its rebuilding after the 9/11 attacks. "Dan Doctoroff has done more to change the face of this city than anyone since Robert Moses," Bloomberg once said. He had become CEO of Bloomberg's media company and then left when the former mayor unexpectedly returned. And the company started looking for land. ▲ In theory, smart cities could be dense, transit-friendly and accessible to the middle class. In Toronto, Sidewalk says it's aiming to achieve a 14 percent reduction in the cost of living for residents. ▼ In reality, new construction usually means high-priced apartments and condos. Older neighborhoods with less well-off people don't get this level of intelligent networking, potentially driving up inequality more broadly. Doctoroff had learned in New York that it's far easier to build where there are no people, and where higher levels of government can't tell you no, and Toronto had a rare opportunity on the table. Appealingly, it was on the waterfront, and the city was ready for it to change. It even had a new government structure in place to oversee the property, an entity called Waterfront Toronto, made up of three layers of government - city, provincial and national - which itself is the product of a failed Olympic bid. Its job was to make something happen. That so much of government was already on board with the waterfront project was hugely appealing to Sidewalk. Canada's youthful prime minister, Justin Trudeau, was invested in the idea; he had already been talking to Google's leadership about the possibility of a second Silicon Valley north of the border. But in Schmidt's view, there was more than that in Toronto's favor. The local tech sector was booming. In fact, the very artificial intelligence that powers post-search Google was in large part pioneered at the University of Toronto. Toronto, whose population is half foreign-born, is a magnet for immigrants, and "technology is powered by immigrants," said Schmidt. "out of the entire world, the single place that we thought was the best was Toronto." Waterfront Toronto issued a request for proposals for the site, with a tight turnaround of six weeks. Sidewalk scrambled and generated a plan hundreds of pages long, complete with quirky line drawings of local features, that offered a sweeping vision of a neighborhood built from the ground up - actually, from below the ground up - to be a home for innovation. It got the contract. "We know the world is changing, and the choice we have is either resist it and be frightened by it" - here, the PM mimed a grimace while pushing back an imagined force - "or to say, we can step up, together, and shape it." So far, the deal hasn't exactly been a victory for transparency. Waterfront Toronto has declined to make the exact terms of its deal with Sidewalk public, so no one on the outside knows exactly what the city has promised Google, or vice versa. But the basic idea is for Sidewalk to go on a yearlong local listening tour, brainstorming along the way for a master development plan for the dozen-acre slice of land. If the plan is approved by Waterfront Toronto's board, that group and Sidewalk will serve as co-master developers, with the latter in charge of funding and "innovation" - how to design streets to handle self-driving cars, or how to build underground utility channels serving as conduits for city services that haven't even been dreamt up yet. Charged with pulling all this off is Rohit Aggarwala, Sidewalk's head of urban systems. Known as "Rit," Aggarwala - like Trudeau, a spirited 46 - sports rimless glasses and close-cropped hair, and is something of the brains behind the Sidewalk Labs operation. "clearly one of the most important potential new neighborhoods in North America." on a street corner - including cars aware of their surroundings. ▲ The "smarter" a city is, the easier it is to manage well - from streets pre-built for self-driving cars to a self-sorting trash stream to lawn chairs that can tell you if they're free. ▼ But the algorithms that control resources can be a black box, operated by private companies - to say nothing of losing the random interactions that make cities so dynamic. Part of the founding team at Sidewalk Labs, Aggarwala made a study of neighborhoods, even whole cities, designed from scratch. One was the original Epcot, which he credits as a visionary project that tried to ambitiously "move the needle" - in part by trying to conquer the sometimes inhospitably hot and humid environment of inland Florida with a vast downtown dome. With cars banished below ground, humans would travel around instead via never-stopping electric-powered trollies called People Movers. Prefiguring the philosophy of "iteration" that would come to dominate Silicon Valley, Walt Disney said in the 1966 film that Epcot would "always be in a state of becoming." It's an important principle, says Aggarwala. Even a highly planned community isn't done just because it's opened its doors. What's more, even cities built from scratch aren't built in a vacuum, separate from traditional politics or conventional local goals. Aggarwala's counterpart in government is Kristina Verner, who once taught computer science at the nearby University of Windsor and now directs the innovation and sustainability portfolio for Waterfront Toronto. She considers herself a "smart-cities nerd" but says that the "smart city" branding that's attracted so much attention is more Google's than Toronto's. The city itself was mainly interested in the promise of solid economic development and a quick timetable. There was the financial commitment, in the form of the pledge of some $50 million poured into developing a plan for the site, and its ability to deliver that plan in a single year. 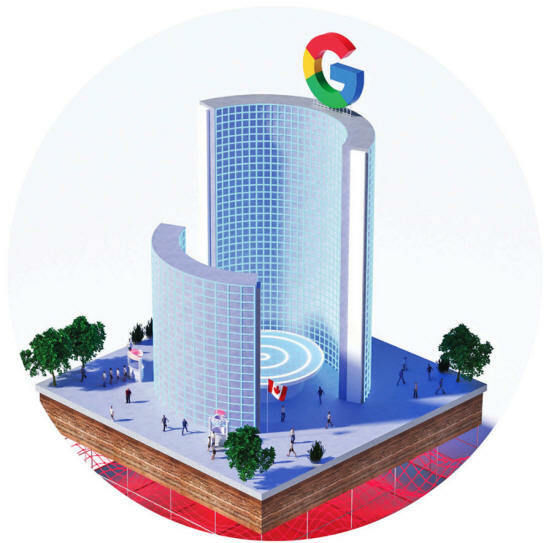 Appealingly, Google itself promised to anchor the project, moving its Canadian headquarters from Toronto's financial district down to a to-be-determined spot on the eastern waterfront. But most attractive, she says, is that Sidewalk's proposal was soup to nuts. It was not simply a smart-cities play; it considered everything from sustainability to housing. "Sidewalk's response was holistic in its answers to the questions posed," Verner says. The relationship between government and Sidewalk remains a work in progress, and some critics worry that handing over too much control to a private company will set the wrong precedent. By definition, the autonomy of a smart city means taking some hands-on day-to-day decision-making away from elected officials and civil servants. And when the complex algorithms and data-collection decisions driving those city operations are in the hands of one company, that can raise worries that too much power over our civic lives is being handed over to private interests. "Blurring the line between what is the public sector and what is the private sector is the thematic concern here," says Bianca Wylie, a Toronto-based open-government advocate and co-founder of the group Tech Reset Canada. What are we talking about? What kinds of products and services are we talking about? And we're in this situation where we're making policy on the fly with a vendor." This is the first, and maybe broadest, point of concern that has started to bubble up about smart cities, not just in Toronto. Using data to organize and optimize, Google's expertise since its early days as a search company, makes a lot of sense in the online world, the argument goes, but is a far different tool when it's applied to the chaos that makes cities cities. Allison Arieff, a San Francisco urbanist and design writer for the New York Times, says she is reserving judgment on Quayside - after all, a shovel has yet to be put into the ground or sensor hooked up - but considers herself wary. long-term, and driven by civic improvement rather than stock prices. The most fundamental flaw she sees when it comes to Silicon Valley's city-building ambitions is the gap between what data can and can't do. The beauty of urban life is what happens organically, argues Arieff. "They really do believe in their heart and soul that it's all algorithmically controllable," she says, "and it's just not." that it's all algorithmically controllable,"
At the street level, another worry is that Sidewalk could exacerbate a trend in urban innovation toward intentionally cutting down on actual human interactions. If even the beach chairs are wired and reservable, do neighbors ever have to meet? An example of what concerns urbanists is the "meatless and wheatless" eatery near Google's current Toronto headquarters, at which there are separate counter locations for picking up orders made via two competing Toronto-based food apps. Local workers breeze in, flash a phone, grab their prepackaged almond lime bowls and breeze out. It's impossibly efficient, and appealing to young tech workers who never have to take out their earbuds, but it also eliminates the most basic kind of human interaction at the heart of city living. This is a growing critique of the "smart cities" movement, and I put it to Aggarwala. "It is taking it to a ridiculous extreme the idea that, 'Oh, you can run everything by an algorithm'," he shoots back - and thinks the critics are missing the point. Urbanists like Arieff, or the famed author and activist Jane Jacobs, value the fabric of cities for its density, life and serendipity. Aggarwala sees data as a way to protect and improve that experience, not replace it. Traffic signals already in place in many cities are timed to make it so no driver is kept waiting at a red light on an empty street in the middle of the night - making cities both safer and smoother-running. Expanding that technology could do the same for the pedestrians that urbanists love. "optimize everyone's needs in a more rational way." Sidewalk's idea for snow-melting sidewalks would let residents enjoy more of the city for more of the year. Self-driving cars, integrated properly into the streetscape, could make it more humane. "If you can count on a car to go straight down the middle of the street and obey the speed limit at all times, you can redesign the street" in all sorts of ways, he says. If all this seems like a great deal of attention directed at a tiny plot of land that takes about eight minutes to cross on foot, that's because there is, lurking behind Quayside, far more on the table. Just about all players involved believe that if Sidewalk can be successful at Quayside, it has a shot at the adjoining 800-acre Port Lands, a swath of problem space big enough to become home to a dozen new neighborhoods in a growing metropolis. "That's a city they're going to build there. This is just the warmup, this little piece." A project on that scale - a dozen neighborhoods in one of the highest-profile cities in North America - could set the tone for urban development all over the world from here on out. What sort of tone that will be, though, is the big question, and one area in which there are the fewest answers is the simple matter of information. and with a Canadian flag waving out in front. ▲ Data-driven city-making is egalitarian in one sense - it generates feedback from citizens, and sensors count everyone who walks down a sidewalk, rich or poor, powerful or obscure. A truly smart city stands to radically increase the amount of data collected on its citizens and visitors, and it puts into sharp relief the responsibility a local government - and the contractors it would inevitability hire to manage some of that digital infrastructure - would have to both hold and probe that data. That dynamic quickly turns the future of the smart city from a technological question to a fundamentally civic one. Heaps of data are already piling up in cities around the world, with very little agreement on the best way to handle all that information. Toronto could well be a test bed, a suggestion Doctoroff has made himself. "There are cameras everywhere anyway. There's chaos out there. Together we can bring order." Whose "order" will it be? That's what worries people. Take Dubai, says Ann Cavoukian, a civic-privacy specialist who is consulting for Sidewalk on the Toronto project. "It's horrible - the antithesis of privacy. They use sensors to identify everybody and track their movements." That city in the United Arab Emirates set out in 2014 to become what it called the world's smartest city. "In Dubai, we believe that happiness can be measured, and that we can aid our leadership to positively impact happiness for the city, through science and technology." Cavoukian served three terms as Ontario's privacy commissioner and is now Sidewalk Labs' lead outside privacy consultant on the Toronto project. She is known for having developed a concept called "privacy by design," which in its simplest form argues that privacy must be baked into everything from software to cities from the very beginning. In an ideal privacy regime, the system can't track individuals; any personally identifiable information on people living in or moving through Quayside would be scrubbed right at the sensor. So a sidewalk, for example, could track the flow of pedestrians all day without ever knowing who they were. "You strip the personal identifiers, you get rid of the privacy concerns," Cavoukian says. Aggarwala says that over time Sidewalk has come to appreciate "how deeply different" the Canadian view of privacy is compared with that in the United States. Canadians tend to see privacy as a fundamental human right; Americans have historically been more willing to see it as something that should be protected, with abuses punished after the fact, but which can be traded away in exchange for some benefits, like free Gmail. Google makes its billions in large part by collecting data on its users and slicing and dicing it for the benefit of advertisers. Sidewalk has already stipulated that data collected in Quayside won't be used for advertising purposes. "It's not going to be a smart city of surveillance. It's going to be a smart city of privacy, and that will be a first." But even if, as Cavoukian contends, stripping personally identifiable data at the sensor in most cases largely addresses privacy concerns, other worries remain. Some privacy advocates worry about the idea of collective privacy, or the idea that data can be used to know things about communities they would rather not have everyone know, like tracking residents' movements to create a profile of the overall rhythms of a neighborhood, or even analyzing sewage for signs of concentrated drug use. That issue hasn't come up for discussion in Quayside, Cavoukian says. And then there's the idea of what sort of entity makes the calls on how the data can be used. Waterfront Toronto's CEO has floated the notion of a "data trust," a third party that would make decisions about proper uses of the information collected at Quayside. While many of those questions of data are still abstract, one particularly pressing concern is data residency - simply put, where the machines that hold the data generated by Quayside will actually reside. That matters, in part, because the laws of that place will largely govern how it can be used. The information economy depends on highly networked, decentralized systems that share data across companies, devices and borders. This data sharing has lately become a political issue, in part because the United States' handling of data has been the subject of global suspicion since the revelations of Edward Snowden. ...reacted to evidence of U.S. companies' sharing of user data with the U.S. government by demanding so-called data localization or data sovereignty - requiring that information that affects a country's people must be physically housed inside its borders. "the U.S. is no longer at the forefront" of that debate. Canadians see privacy as a fundamental human right; Americans see it as something that should be protected, with abuses punished after the fact. When it comes to Quayside residents, Cavoukian says the data should stay in Canada - be collected, processed and stored on Canadian servers. Waterfront Toronto's Verner, though, isn't so sure that's possible or even wise. As they have worked through the planning process for Quayside, she says, they have come across instances where it makes sense to let the data migrate, such as if the expert best able to solve an issue with a sensor in Toronto is located in, say, New York. Or if a company providing a service riding on top of the Sidewalk-powered digital layer is housed on the other side of the world. "is a layer of making sure we've got an entire help desk, call center, or whatever it is here in Canada" - and that, she says, might not be practical. As the data debate makes clear, there's much here that isn't going to be in Toronto's hands, or even Sidewalk's, and it's not clear that the city has worked out that issue yet. Townsend, the former Sidewalk consultant, jabs that thus far in Toronto, Sidewalk has spent more time discussing garbage innovation than data management. "This is the city-level question of our time," he says. "And they haven't taken the slightest step in trying to even create a vision there." ...but say it's still a work in progress. Verner argues that the conversations will flow more freely once there are specific technologies to which to react. Cavoukian, for her part, holds that Sidewalk's only failing thus far is not pushing back aggressively enough against complaints about the company's seriousness when it comes to privacy. The company is giving every sign so far, she says, of making the correct moves. The tech industry famously moves quickly, municipal governments less so. And as tech companies grow more interested in building cities of the future, some urban-development experts are drawing attention to what they say is a power imbalance. On the one hand, there's a well-funded industry comfortable with navigating the cutting edge of innovation. On the other, there are local governments eager to get their hands on tech's benefits quickly - but which often lack the time, money and expertise to properly assess what, exactly, they stand to gain from it. Cities can find themselves at the mercy of companies pitching everything from shiny new apps to, in the case of Amazon, a shiny second headquarters. "Toronto got excited, people in the city are demanding this new city, and the city has, a little bit, lost control of the conversation," says Simone Brody, executive director of Bloomberg Philanthropies' What Works Cities. "This isn't just a Google-Toronto problem. It's an Uber problem. It's an autonomous vehicle problem. Cities haven't figured out how to take the power back." ▼ But that extreme dependence on digital networks can make cities vulnerable to everything from simple power outages to malicious hackers - both of which are capable of stopping unprepared cities in their tracks. Sidewalk says it appreciates the balance and takes pride in not nudging cities for handouts. Even Townsend, who can be critical of Sidewalk's work on Toronto, says it compares well on that point to Amazon, whose high-profile headquarters search has seen cities competing to offer the giant the sweetest deal. "I think Amazon is always going to be an occupying force wherever they end up." But Simone Brody argues that even where companies attempt to carefully navigate that power imbalance, it exists. The cold hard fact is that while cities have struggled, Silicon Valley has companies that have produced astonishingly large heaps of cash. And in many cases, they need places to put it. One way of looking at the Sidewalk Toronto project, argues Townsend, is as a bid for a hugely valuable piece of real estate dressed up with a bit of what he calls "smartwashing." Google has been in the market for attractive properties in knowledge centers lately. It recently bought Manhattan's Chelsea Market for a whopping $2.4 billion. For companies with overflowing coffers, cities are an attractive place to put that cash. Municipal governments, naturally, welcome those deep-pocketed corporate citizens, who often come bearing ideas for urban improvements. But officials might soon find that those companies end up owning not just slices of real estate but also, as they take on more local responsibility, huge chunks of information about how cities themselves function. "When it comes to future negotiations, it's frightening that Google will have that data and cities won't," Brody says. Sidewalk has pointedly engaged in a series of public meetings and online consultations meant to give Torontonians a voice in the process. "We are aware that we can't do anything without government," Doctoroff has said, "and we are extraordinarily respectful of it." An on-site pavilion is meant to open up in Quayside in late summer. Some in the urban affairs world see that back-and-forth as a huge improvement over how developers tend to work, and give Sidewalk credit for rethinking the often hopelessly adversarial process that often marks real-estate projects. "This is really a grand experiment, in many respects, that is going to teach not just Toronto but really cities all across the world what is the future city going to look like," says Bruce Katz, the author and former Brookings Institution official. "And I can't imagine a better group of people to be entrusted with it." "Of course," he adds with a laugh, "if you're Toronto, you're the lab."